Real Ale has never been bigger. Although Lager still dominates the UK drinking market, the rise of Real Ale popularity has been astounding. Pair this with the on-going Gin revolution, strong interest in artisan Vodka and American Bourbon Whiskeys, and the UK is in the grip of a beverage renaissance. Interestingly, this hasn’t come at a price either. Usually when a product becomes popular, it gets diluted down, repackaged and sold to the masses. 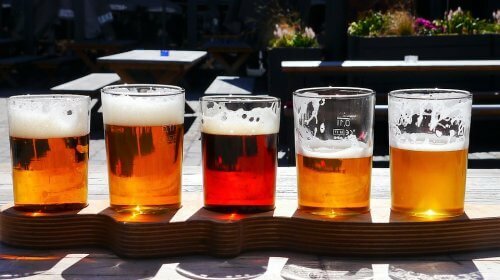 Although of course there are some instances of this, the worlds of Real Ale and Craft Ale have strengthened their offering, without sacrificing their core principals or diversifying into something they are not. Instead they have expanded their products and become more radical with the beers that they produce, pushing boundaries through using unusual hops in odd combinations to make inventive and interesting beers. Additionally, instead of being repulsed or confused, the British Public have literally drank it up. 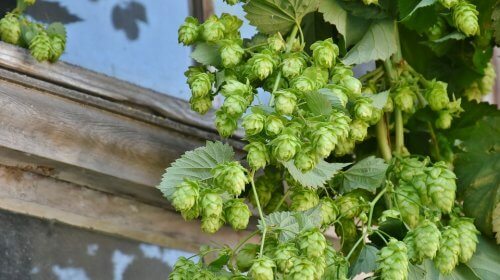 Using different varieties of Hops has led to bigger and different flavours of Beer. This has led to the established differences between traditional Real Ales and Lagers becoming blurred. With the popularity of Craft Ale and the increase in small breweries, the beer scene has become more vibrant. These producers brew a constantly turning carousel of beers, made up of seasonal brews, limited editions or special one offs. The Beers themselves range from traditional pale or amber ales, right through to porters, stouts and on to the strong, citrus, hoppy infused worlds of Double and even Triple IPA’s. Like high-end restaurants and chefs pushing the boundaries of food through gastronomy, Beer is being pushed beyond its traditional limitations. There’s a new breed of ‘Beer head’. These men and women are unashamed of their love for beer, and actively chase down the newest, latest beers from breweries and producers. This kind of fandom and behavior is more readily associated with Trainer or Record collectors. Just 20 years ago, this kind of Beer appreciation was unthinkable. Interest in beer now far exceeds CAMRA membership. Being into Beer and understanding what you are drinking is more than acceptable, it’s fashionable. 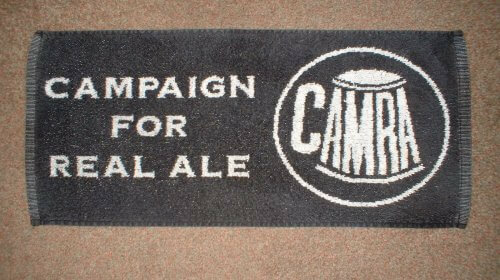 CAMRA are instrumental in the Real Ale world. Here’s a branded Bar Runner. In the Noughties, fresh and exiting brewers such as BrewDog started appearing on the scene, causing up roar and excitement not seen for a long time. Although now in 2019 you would be forgiven for thinking that BrewDog have always been part of the Brewery World furniture, their campaign to get there was built on clever, provocative marketing campaigns, punk ethos and an exciting disregard for the established order. As you’d expect, this approach riled, disgruntled and intrigued in equal measure. Luckily for BrewDog the quality of their beer paired with their outlook won a lot more plaudits than it did detractors. Their flagship brew, Punk IPA, has since been transformed from the upstart who headed the rebellion, into a benchmark Craft Ale beloved by many, and dare we say it, is now part of the mainstream. If you haven’t had it in your pub already, get in touch and order a barrel. 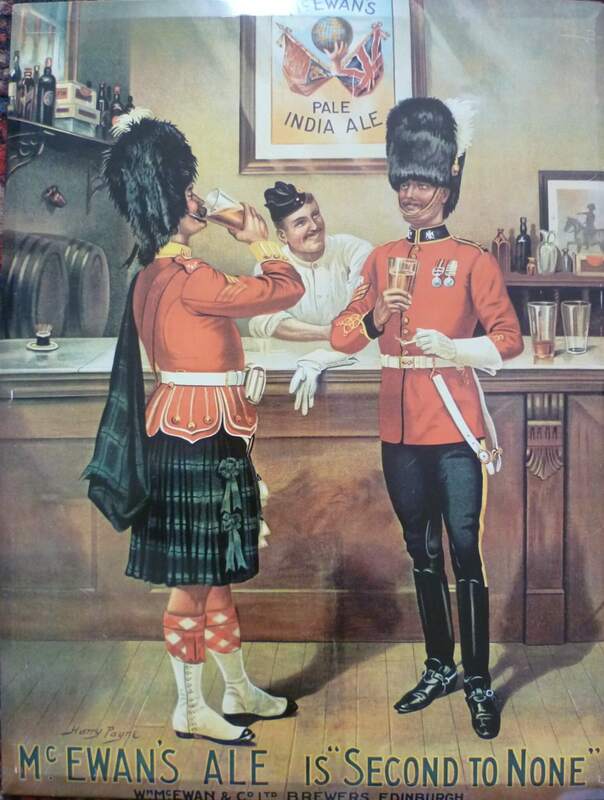 Before the Millennium, a lot of Real Ale advertising made use of British Stereotypes and Patriotic Imagery like this McEwan’s advert from 1906. Despite breweries like BrewDog and changing trends, Real Ale is still rooted in traditionalism and that is to be celebrated. Real Ale was once seen as ‘Proper Beer’ compared to carbonated watery Lager, but this has also changed too. While Real Ale might always be the ‘original’ Ale brewed in Britain, the Lager on offer today is of much better quality and flavour compared to the 1970’s when CAMRA was set up. Furthermore, there isn’t a ‘Us vs Them’ mentality between Real Ale and Lager drinkers down the pub, as often stereotyped. There might be some playful banter but you’re much more likely to see a unity created by a love of a pub and all things beer. If you’re a staunch Lager drinker, there is definitely a real ale out there that you would love, you just have to find it. Trust Inns have a comprehensive range of Real Ale beers available. This vary from traditional cask ales through to modern craft ales and feature well-known names like Hobgoblin, BrewDog, Black Sheep, Adnams, Greene King, Moorhouses and Timothy Taylor amongst others. Please see our product list for more details. To read more blog posts about beer please check out our blog home page. Alternatively you might find out post about vegan beers of interest or our post on World Lagers.